At that time, Manjushri Bodhisattva, after speaking the verses, told the Youth Good Wealth, “Good indeed! Good indeed! Good man, you have already brought forth the resolve for anuttarasamyaksambodhi to seek the conduct of a Bodhisattva. Good man, if living beings can bring forth the resolve for anuttarasamyaksambodhi, this is a difficult thing indeed. Moreover, upon bringing forth the resolve, if they further wish to seek the Bodhisattva conduct, this is twice as hard. “Good man, if one wishes to accomplish the wisdom of All-Wisdom, then one must decisively seek a true good knowing advisor. Good man, in seeking for a good knowing advisor, do not become weary or lax. And upon seeing a good knowing advisor, do not become satiated. As to a good knowing advisor and all his teachings, you must follow and accord. As to expedient devices employed by a good knowing advisor, do not find faults. “Good man, south of here is a kingdom called Supreme Bliss. Within that kingdom is a mountain called Wonderful Summit, and on that mountain is a bhikshu named Cloud of Virtue. Go to where he is and ask him how a Bodhisattva studies the Bodhisattva conduct, how a Bodhisattva cultivates the Bodhisattva conduct, up to and including how a Bodhisattva can swiftly perfect the Conducts of Universal Worthy. The bhikshu Cloud of Virtue will proclaim all of this for you." At that time, upon hearing this, the Youth Good Wealth leapt for joy. He bowed at his feet, circumambulated him countless times, and gazed up at him with longing admiration. He sorrowfully wept, he bade farewell and took his leave and went south. At that time, the bhikshu Cloud of Virtue told Good Wealth, "Good indeed! Good indeed! Good man, you have already brought forth the resolve for anuttarasamyaksambodhi. Moreover, you can inquire about the Bodhisattva conduct. To do such a thing is difficult within the difficult. That is to say: seeking the Bodhisattva conduct; seeking the state of a Bodhisattva; seeking the path of escape of a Bodhisattva; seeking the pure path of a Bodhisattva; seeking the pure, vast, great mind of a Bodhisattva; seeking the spiritual penetrations accomplished by a Bodhisattva; seeking the liberation doors that a Bodhisattva makes appear; seeking the worldly karma manifested by a Bodhisattva; seeking the mind of a Bodhisattva that accords with living beings; seeking the Bodhisattva's gate of birth and death and Nirvana; seeking the Bodhisattva's contemplation of the conditioned and unconditioned, without any attachment in his mind. “Good man, I have attained a comfortable, decisive power of understanding. My eye of faith is pure, and my wisdom light radiates. Universally, I regard all states, and have left behind all obstructions. I can skillfully contemplate. My universal eye is lucid and bright. I am replete with pure conduct. 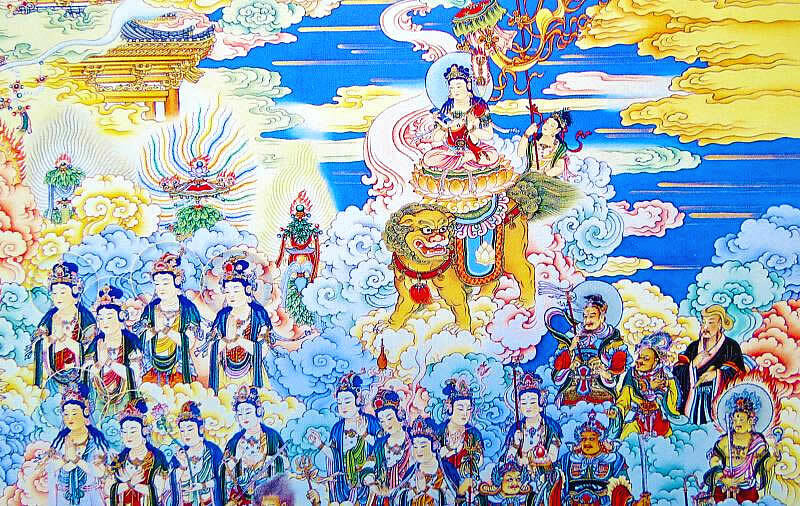 I can travel to the countries of the ten directions, revere and make offerings to all Buddhas. 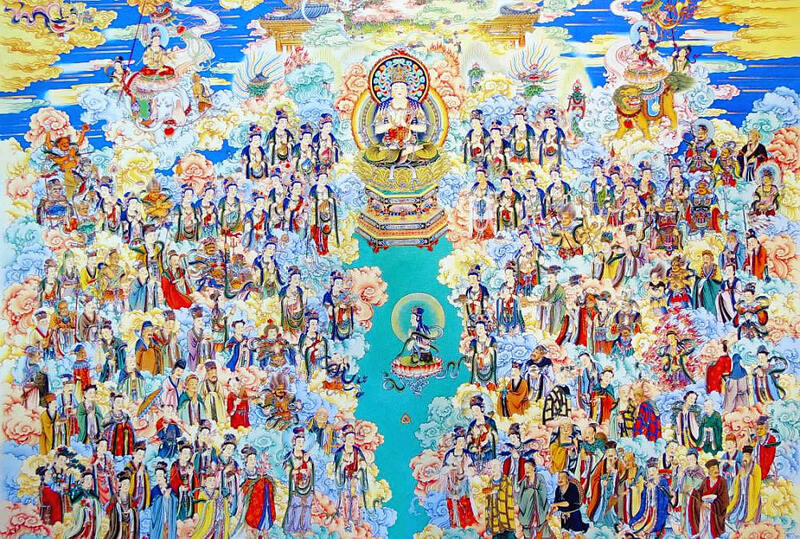 I can forever be mindful of all Buddhas, Thus Come Ones, unite, uphold the Proper Dharma of all Buddhas, and constantly behold all Buddhas of the ten directions. “That is to say, to the eastern direction, seeing one Buddha, two Buddhas, ten Buddhas, a hundred Buddhas, a thousand Buddhas, a hundred thousand Buddhas, a hundred million Buddhas, a billion Buddhas, a thousand billion Buddhas, a hundred thousand billion Buddhas, a million nayutas of Buddhas, a hundred million nayutas of Buddhas, a thousand million nayutas of Buddhas, a hundred thousand million nayutas of Buddhas; to the point of seeing countless, limitless, boundless, unequaled, uncountable, inestimable, inconceivable, immeasurable, ineffable, ineffably ineffable Buddhas; to the point of seeing Buddhas as many as dust motes in Jambudvipa, Buddhas as many as dust motes in one set of four continents, Buddhas as many as dust motes in a thousand world systems; Buddhas as many as dust motes in a two thousand world system; Buddhas as many as dust motes in a three thousand world system; Buddhas as numerous as dust motes in ten Buddha kshetras; up to and including Buddhas as many as dust motes in ineffably ineffable Buddha kshetras. As it is in the east, so it is too in the south, west, north, the four intermediate directions, above, and below. In each direction, all of these Buddhas -- with their various physical appearances, their various features, their various spiritual penetrations, their various playfulnesses, their various assemblies which adorn the Way-places, their various lights that illumine without limit, their various countries, their various life spans -- accord with the various delights in the minds of all living beings. They manifest the various doors of accomplishing Proper Enlightenment. Within the great assembly, they emit the Lion's roar. “Good man, I have only obtained this dharma-door of recollecting all the Buddhas' states of Wisdom Light and Universal Vision. But how could I possibly know the Doors of the conduct of all great Bodhisattvas' boundless, pure wisdom? There is the Door of Mindfulness of the Buddha with a Universally Shining Wisdom Light, whereby one always sees the adornments and purity of the various palaces in all Buddha countries. There is the Door of Causing All Beings to be Mindful of the Buddha, whereby one accords with what pleases living beings' minds and causes them to obtain purity from seeing the Buddhas. There is the Door of Mindfulness of the Buddha that Enables One to Dwell Securely within the Powers, whereby one is caused to enter the Thus Come Ones’ Ten Powers. There is the Door of Mindfulness of the Buddha that Enables One to Dwell Securely in the Dharma, whereby one can see limitless Buddhas and listen to Dharma. There is the Door of Mindfulness of the Buddha of Illumining All Directions, whereby one can see within all worlds the seas of Buddhas that are equal and without discrimination. There is the Door of Mindfulness of the Buddha of Entry to Invisible Places, whereby one can see within all subtle and minute states, all matters involving the sovereign spiritual penetrations of all Buddhas. There is the Door of Mindfulness of the Buddha of Dwelling in All Kalpas, whereby throughout all kalpas one always sees the acts of giving done by all Buddhas without leaving them for even a moment. There is the Door of Mindfulness of the Buddha of Dwelling Throughout All Times, whereby in every time all times one always sees the Thus Come Ones, draws near to them, without leaving them. There is the Door of Mindfulness of the Buddha of Dwelling in All Kshetras, whereby in all countries one completely sees the Buddhas' bodies that transcend everything and are unmatched by anything. There is the Door of Mindfulness of the Buddha of Dwelling in All Worlds, whereby in accordance with the wishes and delights of one's own mind, one universally sees the Thus Come Ones of the three time periods. “There is the Door of Mindfulness of the Buddha of Dwelling in All States, whereby pervasively in all states, one sees the successive appearances of the Thus Come Ones. There is the Door of Mindfulness of the Buddha of Dwelling in Still Extinction, whereby in a single thought one sees the Buddhas in all kshetras manifesting Nirvana. There is the Door of Mindfulness of the Buddha of Dwelling in Distant Traveling, whereby in a single thought one sees all Buddhas departing from the places where they live. There is the Door of Mindfulness of the Buddha of Dwelling in Vast Greatness, whereby one's mind always contemplates all the Buddhas’ bodies pervading all Dharma realms. “There is the Door of Mindfulness of the Buddha of Dwelling in Subtlety, whereby on a single hair tip ineffable Thus Come Ones appear, and one can go to all their places and serve them. There is the Door of Mindfulness of the Buddha of Dwelling in Adornment, whereby in one thought, within all kshetras, one sees Buddhas accomplishing Equal and Proper Enlightenment, and manifesting spiritual transformations. There is the Door of Mindfulness of the Buddha of Dwelling in Buddha Affairs, whereby one sees all Buddhas appearing in the world, emitting wisdom-light and turning the Dharma Wheel. “There is the Door of Mindfulness of the Buddha of Dwelling in the Comfortable Mind, whereby one knows that according to all the wishes and delights of one's own mind, all Buddhas manifest their reflections. There is the Door of Mindfulness of the Buddha of Dwelling in One's Own Karma, whereby one knows that, according to the karma which living beings accumulate, their own reflections manifest to facilitate their enlightenment. There is the Door of Mindfulness of the Buddha of Dwelling in Spiritual Transformations, whereby one sees the Buddhas seated on vast great lotus flowers that blossom everywhere throughout the Dharma Realm. There is the Door of Mindfulness of the Buddha of Dwelling in Empty Space, whereby one contemplates all Thus Come Ones’ clouds of bodies that adorn the Dharma Realm. And how can I possibly know or speak of such conduct of merit and virtue? “Good man, south of here is a kingdom called Gate of the Sea, there is a bhikshu known as Sea Cloud. Go to where he is and ask him how a Bodhisattva studies the Bodhisattva conduct, and how he cultivates the Bodhisattva path. At that time, the Youth Good Wealth bowed to the bhikshu Cloud of Virtue, circumambulated him to the right, gazed up at him, bade farewelland took his leave.